'Blue Plaques' is the title of the last chapter of my first book, The Woman Who Saved the Children, a biography of Eglantyne Jebb, the inspirational founder of Save the Children. In it I looked at all the memorials that have gone up to this remarkable woman. These include a community sports hall in her home-town of Ellesmere in Shropshire, the thriving village of Xheba in Albania, an English rose, and one of the better-known dogs belonging to HRH, The Princess Royal, Princess Anne - the Princess is the President of Save the Children, and one of many to admire the charity’s founder. Eglantyne had a wonderfully dark sense of humour, and I think that this rather eclectic assortment or memorials would have amused her. As would the glass chandelier that hangs in the chapel of Lady Margaret Hall, the Oxford college where she had once read history. Each pendant is in the shape of a ‘white flame’, reflecting the nickname that she had earned for her burning passion for her work, as well as for her prematurely white hair. The chandelier was paid for by subscription among Eglantyne’s former college friends, but it has always amused me that among her papers I found a letter that Eglantyne wrote to her mother during her college days, bemoaning the dullness of her fellow students. If the new intake were as tedious next year, she joked, she would liven things up by putting a bomb in the chapel. And now she is remembered there with this very pleasant, if not wildly exciting, glass chandelier. After Eglantyne’s death in 1928, blueprints were also produced for a stone bench, featuring Save the Children’s original logo, the swaddled babe, to be placed at the top of Mount Saleve outside Geneva in Switzerland. Eglantyne spent her last ten years in Geneva establishing the International Save the Children Alliance, and developing the five-point statement of children’s universal human rights that has now been enshrined as the United National Convention on the Rights of the Child, the most universally accepted human rights instrument in history. Permission was given for the bench, but when Eglantyne’s sister, Dorothy, discovered how expensive it would be, all donations were reallocated to support children in need in Ethiopia instead. No doubt Eglantyne would have approved. Of course Eglantyne’s real legacy is not a stone bench, a sports hall, or glass chandelier; it is the wonderful work of Save the Children, saving the lives and improving the life chances of millions of children every day, and the value of the UN Convention, by which institutions, and even governments, may be held to account. However, I was delighted a few years ago when a Blue Plaque was put up at 82 Regent Street, in Cambridge, to mark the building where Eglantyne once worked for a local charity. 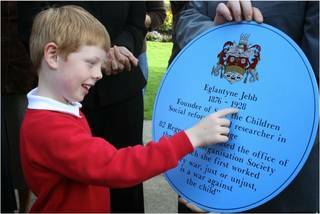 The photo above shows Eglantyne’s Blue Plaque, with her dates being pointed out by her great, great, great nephew - who was marvelous at the event, suggesting we used it as an opportunity to raise some funds for the charity. He himself brought some pumpkin seeds to sell, which I duly bought and potted out with my own children. I am afraid to say that the seeds grew into marrows, so he may be considered a swindler, but absolutely the nicest I have met. So it was with great disappointment that I learned recently that Eglantyne’s blue plaque has been removed. The building has been sold and the developers feel it reduces the value of the site! Save the Children has certainly had a bad couple of weeks since the US arm of the organisation decided to award their annual ‘global legacy’ prize to former British Prime Minister Tony Blair for his work tackling child poverty while in office. During this time Blair led the G8 nations at Gleneagles to agree to a doubling of aid to Africa, debt cancellation and universal access to Aids treatment. However, Blair’s public legacy has since been overshadowed by his role taking Britain to war in Iraq, actions that Save the Children UK strongly opposed at the time. Hundreds of the UK staff, and thousands of others, have called for the prize to be rescinded, and meanwhile the charity, its many supporters and, most importantly, the children assisted by projects around the world, are facing a serious crisis in terms of support. However, I doubt that this is what the Cambridge developers were concerned about. 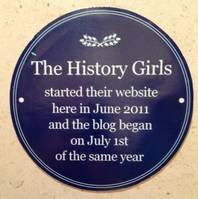 Blue plaques are street signposts that operate in another dimension. Instead of showing the way to the motorway or market, they point back in time to the special agent or humanitarian who once lived or worked in that spot – stories that enrich us all as we pass by. I will keep working to try and get Eglantyne Jebb’s plaque replaced. Perhaps the owner of the building opposite might let us project an image of a plaque across the street? Or, once the building is sold again, we might have better luck with the new owners. I will also be keeping my fingers crossed for Christine Granville’s proposed plaque to make it through the final stages at English Heritage. 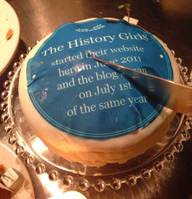 In the meantime I was hugely cheered to see this 'blue plaque' sticker, marking the door of the flat where the History Girl bloggers met for our Christmas party last week - and it was reproduced on one of the cakes too! With signs like these still being made and appreciated, I feel there is hope yet for Eglantyne’s plaque!